I'm not really a writer, but I pretend to be one on the internet. With this being my first blog post, I thought I would share with you a special place to me, my home. There is an old saying "Home is where your heart is", and this is oh so true! 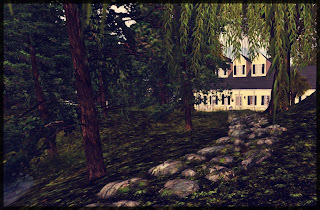 My home is nestled on an enchanting sim we call Whispering Meadow. Over the bridge and tucked away behind the trees, is where you will find my heart. Yellow like the sun, she radiates happiness and joy. The inside is filled with warmth and love. This is my serenity, my safe place, my home.